Jim Alers is the reigning Cage Warriors Featherweight champion. He has outstanding Jiu-Jitsu and has truly rounded out his entire skill set, which should have him on the radar of the UFC in the very near future. Alers wrestled in high school before finding a new hobby in the form of Jiu-Jitsu. 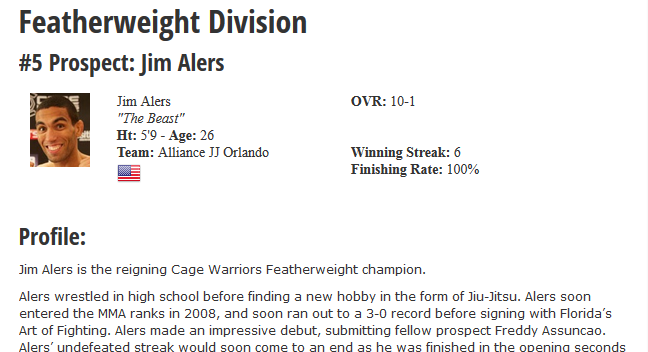 Alers soon entered the MMA ranks in 2008, and ran out to a 3-0 record before signing with Florida’s Art of Fighting. Alers made an impressive debut, submitting fellow prospect Freddy Assuncao. Alers’ undefeated streak would soon come to an end though as he was finished in the opening seconds of his fight with Ronald Jacobs. Alers would spend nearly a year away from the cage, bettering his skills in the gym, and earning his education at Central Florida University. Following his brief hiatus, Alers returned with a vengeance, submitting his next 3 opponents in a combined 3 minutes and 46 seconds. Alers eventually signed with Cage Warriors Fighting Championship (CWFC) in 2012. Alers quickly made his mark, finishing European veteran Matteus Lahdesmaki via TKO. Alers was then tapped as Conor McGregor’s next title contender, but a week leading up to their fight, McGregor pulled out of their fight due to injury. Alers ended up fighting Brazilian veteran Marcio Cesar, submitting him in the 2nd round. Alers called out McGregor in his post-fight interview, but he would never get the opportunity to fight the Irish champ as McGregor was soon signed to the UFC. CWFC put McGregor’s vacated Featherweight title up for grabs as Alers faced off against Finnish prospect Joni Salovaara. 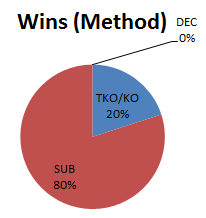 Alers controlled the majority of the fight, finally finishing Salovaara in the championship rounds. Alers trains out of Alliance Jiu-Jitsu and Gracie Barra in Orlando, Florida. Between the two gyms, Alers has trained alongside TUF 12 winner Jonathan Brookins and Bellator veteran Farkhad Sharipov. Alliance JJ and Gracie Barra are two of the leading JJ associations in the sport, so Alers likely has had access to a variety of top-level grappling instructors. His camp doesn’t seem to have an abundance of contacts with the UFC or Bellator, but his recent performances in Cage Warriors likely has caught their attention. Alers is a very well-rounded fighter and truly has the makings of a solid prospect that could one day contend in the UFC. His overall ground game is excellent, despite him not being a Black Belt just yet. Alers’ striking has come a long way over the last few years. He is still a bit stiff, but he’s developed a dangerous right hand that has dropped some of his opponents with it. Alers had some bad blood growing with recent UFC signee Conor McGregor. Though McGregor is off to bigger and better things, it would be no surprise to see these two fighters eventually face off in the UFC. Some are calling McGregor a future UFC champion, but he would have had his hands full with Alers had their CWFC championship fight gone down as planned. Alers has tackled his career in a very methodical fashion. He has continued to better himself in the gym, whether striking or grappling. He has worked his way up through the belt system of Jiu-Jitsu and has already begun finding success at some fairly high-level grappling tournaments. If Alers can continue to work on his striking, he could turn out to be a future contender in the UFC’s Featherweight Division. If I had to compare him to someone in the UFC right now, I would say he reminds me a bit of Hacran Dias.